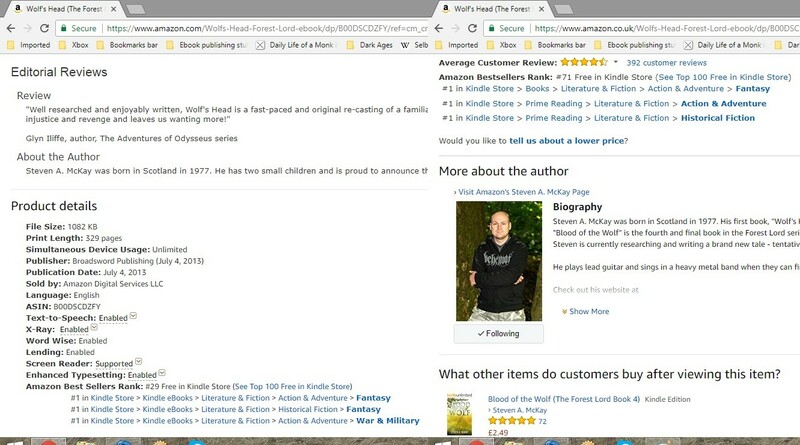 First, thanks to everyone who took advantage of my free promotion for Wolf’s Head over the past three days, and also everyone who shared it on Facebook, Twitter etc. It was really successful, with well over five thousand copies downloaded which pushed it to a stunning overall chart placing on Amazon.com of #29 and #61 in the UK along with #1s in subcategories like “Action Adventure” and “Historical Fiction”. It also did well in the free charts in places like Italy, India, France and the Netherlands leading me to wonder if I should be pushing the books more there…(If any other authors have tips on going about promotions in those countries please get in touch). Hopefully a good percentage of those thousands who downloaded Wolf’s Head this week will read and enjoy the book and, if so, leave a review then go on to buy the rest of the series. If you were one of them – welcome to the Forest Lord series. Join me on Facebook, Twitter etc and let me know what you think of the tales!